Lemony Snicket’s new book series is delightfully strange, much like a Series of Unfortunate Events. The new series actually focuses on himself. The main character is Lemony Snicket as a child. Lemony Snicket picks the worst Chaperon to study under within his secret organization. They are assigned to help Mrs. Sallis, of Stained-by-the-Sea, obtain a lost object. While Snicket is trying to follow his chaperon’s instructions, he’s also trying to find a way to get back to the city and help a mysterious friend of his. Quickly, it turns out this is not a clear cut case of a stolen object. 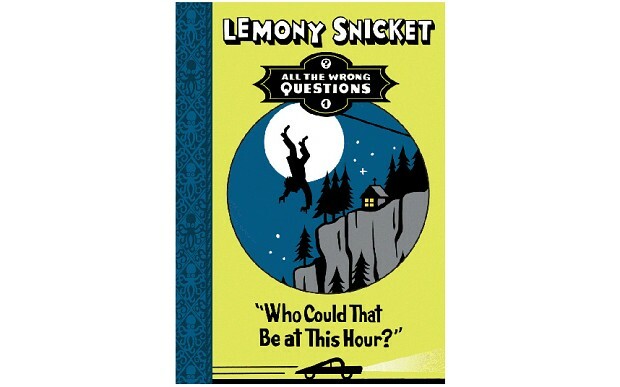 Snicket finds himself on his own with a threatening character named, Hangfire popping up behind a kidnapping and other dark happenings in the inky town of Stained-by-the-Sea. Will Snicket be able to return a lost statue and help his friend in the city? Maybe those are the wrong questions. All The Wrong Questions gives you an insight into the world behind A Series of Unfortunate Events. The characters are all children, well the characters that matter. The adults are all impatient, don’t listen or are absent. You meet Moxie Mallahan, an aspiring and inquisitive (a word meaning to ask a lot of questions), reporter; Ellington Feint who has an interest in music and wants to find her kidnapped Father; and Pip and Squeak, twin brothers that help their Dad by driving the taxi. All the characters are distinct with quirks that help you like or distrust them instantly. The author uses internal monologue to move the story forward at a fast pace. Even though his books are 200 pages, they could be read in a few hours by a faster reader. You never know exactly where the story is going to take you. Most of the time you think you are going to wind up back in the hotel with your chaperon but you end up on an abandoned street with no houses. I love Mr. Snicket’s writing style (aka Daniel Handler). He is humorous, intelligent and never talks down to his target audience. When he throws in unknown vocabulary he always explains the meaning of the word. If you have young adult readers, give them these books. They are full of fun and mystery; independent kids and clueless adults; and vocabulary building tools. I would recommend this book to anyone. The second book, All The Wrong Questions: “When Did You See Her Last” just came out in September.